Hi Whitney! I’m so happy you agreed to sit down with me and chat about knitwear design and what goes on in the world of a talented designer like yourself. Could you tell a bit about yourself, how you got into knitting and designing knitwear, and how you started working for Harrisville Designs? Sure! How I got into knitting: I’ve been knitting since 2010, a skill I picked up from my host family when I was living in Japan for a language study in Nagoya. I was especially terrible at reading Japanese, and I wanted to better connect with my host mom Kazumi, who seemed to know how to do a little bit of everything. Once the weather started to get a bit cooler that year, she started knitting a scarf, and for whatever reason I thought that learning how to knit might help me with my feeble Japanese reading comprehension. It did, and I will never be able to say thank you enough to her for teaching me a skill I hope to use for the rest of my life. It was hard to learn how to read western patterns after learning how to read Japanese patterns, though! I love the way Japanese patterns are written in schematic form, vs fully written. How I started designing knitwear: I continued knitting after leaving Japan, but definitely treated it as a fun hobby that I occasionally picked up, focusing more on journalism. I graduated from my university, and got a job at a mid-sized metro newspaper in Portland, Maine as a staff photojournalist. I loved, and still love, print journalism. I worked for an incredible photo editor, Yoon Byun, who I was lucky to learn from at an early age in my career. My photography would be much crappier if I hadn’t! Despite the best circumstances at the paper, a few years in, I started to feel myself change, both internally and externally. Fires, court, homicide, were all possible daily assignments, and the uncertainty of what the day would hold gnawed at me from the moment I woke up. The entire state of Maine was our coverage area, and I was driving close to 35,000 miles a year; my car felt like my home sometimes! This is when I started to knit voraciously, and would rarely be seen without my knitting, as I was absolutely using it as a coping mechanism. The downtime in the car, combined with the need for a mental distraction, was a perfect reason to non-stop knit. This eventually transitioned to me tinkering with designing out of curiosity, and self publishing a few designs, which, I can admit, did not go well if we’re judging by whether they made me any money! Despite that, I eventually met the people at Quince & Co., who are also based in Portland. At the time, I felt like I was hanging by a thread at the paper, and was incredibly fortunate that they were looking for a new in-house photographer, and someone to help out at Twig & Horn, their side knitting notions company. I quit journalism, and dove headfirst into the knitting industry, eventually starting Stone Wool with Quince. Leila and Dawn at Quince were so foundational to me learning how to be a better knitwear designer, and I’ll never be able to repay them enough for all of the knowledge they imparted. After working at Quince for a few years, I started to desperately miss my family back home in Missouri. My partner has family who lives in Arkansas, and we decided to move back home so we’d be able to visit more often. I left T&H and Stone Wool in incredibly capable hands, and decided to give a try at going freelance. Harrisville yarns (frankly, all woolen spun yarns) are my favorite to knit with, and I reached out to Harrisville to see if they were looking for any freelance designers. I reached out to them at a serendipitous time, as they were looking for a designer to take on a new project they were calling Nightshades. We both felt happy with how the partnership worked with that collection, and that freelance work transitioned into a job at Harrisville as their pattern director. “Knitwear design (hand-knits design) is not a job, but a hobby” seems to be the common thread among many knitters/designers. What are your thoughts about that? Is it realistic to make a living doing knitwear design? Yes, I’ve heard this too. I absolutely think knitwear design can be a hobby, or part-time work, for designers—I think that’s a-ok! However, the idea that knitwear design is exclusively a hobby activity downplays the hard work required to make an accurate, well written pattern. It also illustrates a more troublesome part of designing, that many people (myself included) cannot make a full-time living from knitwear design alone. I think there are two things underpinning this. One, the less serious one, is that most of us who decided to pursue knitwear design enjoy knitting. It’s natural to believe that knitwear design will be as fun and engaging as knitting. As you know, much of the actual work of pattern writing requires no knitting at all, rather math / spatial reasoning problem solving. Math is not a hobby for me, and I suppose most knitwear designers would fall under that camp. It’s hard work. Admittedly with not much quantifiable data to substantiate this belief, I think the perception of knitwear design as a hobby has influenced the average price of knitwear patterns, especially if you compare them to digital home sewing patterns. The second, is that there’s a lot of veiled secrecy about what it’s like to pursue knitwear pattern design full-time, and what most people are making annually. I will pointedly say that I’ve never, ever, earned enough from royalties, publication rates, or self publishing to make a living wage when I’ve worked as a freelance knitwear designer. I’m individually responsible for funding my living expenses, rent, etc, and no way does my royalty-only money come close to meeting those bills. Anytime I’ve been fully freelance, I’ve always supplemented my income with photography assignments, freelance marketing/social media work, etc. Just to break this down a little bit, on average, around 30-50 people download each of my patterns, an average that accounts for some of my patterns that haven’t been so popular, and others that have been more popular than that range. Although I’m so grateful that one person wants to knit something I’ve made, and am worried this next bit will sound as if I’m scoffing at these download numbers, there’s no way I’m able to live on that income alone. Let’s say that a pattern gets 60 downloads, and the pattern is sold at $8/download. That’s $480, classified as self-employed 1099 income, which is taxed much higher than if I earned that $480 through an employer. Let’s then say that I could magically publish 1 garment pattern per week (which would be insane! )—I’d need to get those 60 downloads weekly, and assuming I’m trying to hit full-time at 40 hours per week, I’d be paying myself $11.25/hr, taxed way higher than that wage would be taxed if you worked for a company. This doesn’t even account for paying a tech editor to edit the pattern, compensation for test knitters, hiring a photographer, hiring a model, etc. In most all geographic areas in the United States, this is simply not enough income to pay living expenses in a single income, single person household. I know I have a high amount of privilege, both as a white person, and also in the type of side work I’m able to take on to account for this lack of income, enabling me to continue as a knitwear designer. When I was fully freelance before working at Harrisville, if I didn’t have the ability to take on photography and other side jobs, I undoubtedly would have quit knitwear design for something more stable. Unless a pattern wildly takes off, and I hope I’m not overstepping or painting with too broad a brush in saying this, I don’t think the average designer is making a living wage on knitting patterns alone, without having a second household income, or taking on alternative work. It wouldn’t solve all of these factors at work, but this is partially why I think knitwear patterns should be priced similarly to PDF sewing patterns. If they were, I think it could possibly alleviate some, not all, of the problems making a living wage as a knitwear designer. I designed production sewing patterns and tech packs for Twig & Horn, and though that process is significantly different than designing a home sewing garment pattern, I can say that both take a comparable amount of skill, accuracy, and time. A garment digital pattern could easily cost $15, and to charge that amount for a knitting pattern is relatively unheard of. What does your day look like as a knitwear designer? I usually start work around 7 in the morning every weekday, catching up on emails, customer support and yarn support requests for Harrisville, and communicating with sample knitters. This usually lasts until noon or so, and after that time I work on my own patterns in development for Harrisville collections. This could mean grading math, pattern writing, sample knitting, editing photos, pretty much anything that relates to publishing a pattern. If I’m including sample knitting in this schedule, I probably work until 7 - 8 at night, and I usually sample knit on the weekend. Approximately, how long does it take to design, say, a sweater? I realize this might be a silly question, but still what would be your rough estimate? If you had to break it up into swatching, working out the math, and writing the pattern, etc (without sample-knitting) in terms of hours spent at each stage? This is a tough question to answer, but it’s an important one. I actually kept track of the Carlina pullover timing, so I’ll dig into that specific example, as I think it’s probably an average garment in terms of the time it took. Photography: I think I probably spent 2 hours photographing this pattern, though it’s hard to accurately say because I photographed it with other patterns. Photography edit: Probably another hour or so? Layout in inDesign: 3 hours, which includes creating the sweater schematic, charts, etc. This is a total of 20-21 hours of my labor, which doesn’t include sample knitting. This sweater took me approx 40 hours to sample knit. Not an awesome return on my labor if I get my average amount of downloads, with the pattern selling at $7.5-8! B from Thread and Ladle did an awesome survey of designers last year on time it takes to create a pattern, and if you haven’t seen that definitely check it out! Do you knit the samples yourself? I knit samples myself, and also use sample knitters. I’m designing about 20 garments a year (yikes) and my wrists can’t take knitting all of them. I knit most of the accessories myself. What would you say is a fair compensation for sample-knitting? Sample knitting wage standards are pretty horrible. The most common range I’ve encountered for sample knitting is anywhere between $0.11-0.17/yd, which in many cases even for the fastest knitter, wouldn’t net minimum wage for a sample knitter’s time. We’ve bumped our range at Harrisville anywhere between $0.22-0.26, and I can admit that’s still not a wonderful hourly wage. I’d really like it if eventually, the standard for knitwear pattern pricing could accomodate a much higher sample knit range. Sample knitting is much harder than knitting a pattern, as they are potentially catching problems in a design, and have to think more critically than basic knitting. I wish it were compensated more fairly. Based on your experience, how do companies (publications, yarn companies, etc) generally decide on their compensation systems? For example, some pay a design fee and require exclusive rights to the design for a certain amount of time while others don’t pay anything upfront, but the designer gets to hold all the rights to the design. I think this is largely decided by whoever started the company, or whoever is doing the bookkeeping for the company. This is probably something that seems trivial, but it can be a lot of labor for a company to calculate royalties quarterly, if they work with a lot of designers, and I think the accounting situation at a company possibly dictates the terms co-equally to the knitting direction. I think there are merits to either system, but it really just depends on the design, and how many royalties I might expect from the company, based on how many customers they have. I’ve encountered flat rates, a small royalty percentage in perpetuity, a high royalty percentage for a short amount of time, it all just depends on the company. What advice would you give when it comes to working with yarn companies and magazines? What should a beginning designer pay attention to in contracts and agreements? I think the biggest thing I’d keep in mind when working with a new company, with a contract that you’re unfamiliar with, is to fully, TOTALLY read the whole contract! I’ll be the first to raise my hand and say I haven’t done this in the past. Always know what you’re getting into, and ask questions if something seems unclear. Assume the contract is going to be enforced to the letter. The biggest thing, I think, to watch for is to confirm when payment will be issued after a pattern is delivered, and who is responsible for customer support if knitters have questions. Fielding customer support questions can, sometimes, take much more time (time you already are in the negative for, when calculating the full labor of the design!) so I’d recommend confirming with the company who is responsible for what, if it’s not outlined in the contract. What would you suggest to someone starting with knitwear design: focus on getting published in magazines or focus on self-publishing? This is so dependant upon the designers baseline personality, tough question to answer unilaterally. I think, for me, self publishing was never going to be a viable avenue, as I’m pretty camera shy, and I think that’s a component to successful self publishing. I think some—not all—designers who make a decent living wage from self publishing seem to be pretty comfortable in being the face of their company, and it’s something I’m personally quite bad at! That’s a broad statement though, and I know there are many fantastic designers who routinely self publish without doing this. I’d say, if a designer is just starting out, I’d try pursuing both, and weigh which is making you the happiest, while at the same time weighing which is financially viable. I think this is also largely dependent on your skills, which I touch on in the next question. If you’re not a photographer, or don’t have the ability to lay out patterns, working with yarn companies and publications can be a huge help in alleviating the burden of that work, and is one of the major upsides to working with an outside company. You also don’t have to coordinate hiring a tech editor, which may have an upfront cost hurdle, as most tech editors will need to be paid before you’ve released a self-published pattern. It’s a complicated decision in choosing how you want to work and be published, and one that may not be answerable until you’ve tried both. What skills (besides knitting and math) are essential to knitwear design? Photography definitely helps, This is one of the hardest parts of knitwear design, or anything really, a good picture can sell an ok design, and a bad picture can hide a fantastic design. I use Adobe’s creative suite for layout of all patterns. I use Illustrator to make charts and garment schematics, Lightroom to edit my photos, and inDesign to place photos and text together. Learning all three is undeniably helpful, though I know there are alternatives that others successfully use. Adobe’s creative suite is heinously expensive, and can be hard to learn without previous experience, all of which is a major barrier to getting into knitwear design. These are all factors to weigh when figuring out how you’ll release patterns, if you’re self publishing. Marketing is a big one, and one I’ll confess to not being great at. I think a good eletter list filled with customers who love your design work can be helpful, too. I know once upon a time, Mailchimp had a free tier for people who don’t have thousands of e-letter subscribers, and because Instagram’s algorithm may mean not everyone sees your pattern launches, it can be a good second way of reaching out to people. This is also an area where working with an outside company can be super helpful, as they can do a lot of the marketing heavy lifting. How can one tell if they have a talent for knitwear design? ...if they should continue pursuing this line of work? I think there’s no definitive calculation for determining whether someone should pursue knitwear design. I think the hardest part of that calculation we’ve touched on a bit, in figuring out whether knitwear designers can make a wage they’re comfortable with, and still pay their bills. Aside from the financial side, I think the main thing in determining whether someone can do knitwear design really comes down to two things—ability to do the math, and ability to make patterns that your customers keep coming back to knit. The math part is easy to quantify, and the second part is definitely harder. I think finding a niche, and your voice, as a designer when creating patterns can be helpful (fully admitting that I sometimes don’t take my own advice…) some knitters like exclusively knitting colorwork patterns, and if you’re a colorwork designer, you have a chance of finding customers who will stick with you, wanting to knit the type of colorwork you’re designing. As a knitwear designer, what lessons did you learn that you wish somebody had shared with you? 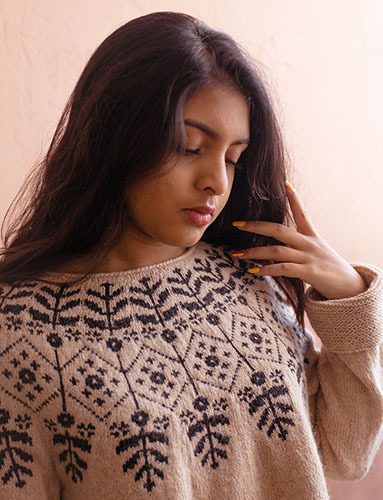 When I started out, I wish I had more information about the financial reality of being a knitwear designer, which is why I’m hopeful that talking more openly about these things will be helpful to other knitwear designers. When I first started out, I wasn’t sure if I was a totally crap designer, because I just wasn’t seeing the return I had hoped/expected when I published my first few patterns. This caused a lot of self-doubt in my ability. I started qualifying my self worth in terms of how many patterns I was selling, and that line of thinking can lead to damaging, unfair expectations on yourself. This can pretty easily poison your ability to generate new ideas, or cause you to start thinking about what’s likely to be “popular” vs what you love to design. In the beginning, I wish I had set more personal boundaries for myself early on, so I had a better grasp on when I was stretching myself too thin. The freelance game can cause fear of ever saying no if an opportunity or idea comes around, because you never know when you’ll get another one. There are times where this can be a valid fear, but it’s less important than making sure you’re maintaining a healthy balance. I also think setting personal ethics boundaries is pretty important to long-term happiness in this work. It’s a privilege to make financial decisions like this, especially when starting out, but I wish I had stopped designing with companies who only seem to work with white designers, use white models (who have also made no effort to enact future change), or pay their sample knitters an unfair wage, much earlier in my career (just as two examples). Staying true to yourself can be hard when it seems like work is hard to come by, and when it’s hard enough to make a living, but I do think drawing these lines when we can is a small cog in changing the industry for the better. Think the last thing that I wish someone shared with me, treat sample knitting as WORK. It’s fun, undeniably the most fun part of designing, but it’s still work. If you wouldn’t be comfortable sitting at a computer for 6 hours without any stretching breaks, don’t do it when you’re knitting! If you can, set aside time for things that are fun, not related to knitting if possible. Maybe that’s crochet, music, drawing, or even knitting another designer’s patterns, whatever, but find something that’s not sample knitting to fill the time. This sounds probably pretty obvious, but take care of your body, and if you feel pain when knitting, stop. Deadlines are less important than your body’s health. For me, the biggest obstacle in knitwear design is the fear of rejection. Have you had to deal with it much? How do/did you get over that? What advice would you give to get past this fear? Rejection is apart of all proposal based work, and it’s one of the hardest parts. I definitely still fear rejection. In the journalism world, a lot of my proposals, job applications, photography has been torn to shreds, and though that’s given me a bit of rejection callus, I can’t pretend that it doesn’t sting when it happens. It’s not always possible, but I’ve tried to turn rejection into something productive when I can. I try and learn why something is being rejected, and attempt to build on it in the future. Maybe the company simply received too many stockinette designs, and they only wanted to publish one in a collection. Or, maybe they’d like to see a more detailed croquis, and because they were on a tight timeline, they decided to go with another proposal rather than asking you to submit something more detailed. It’s not always possible to quantify rejection with a “why” but when I can, it’s information I appreciate. This will seem quite weird, but sometimes I like to disassociate my personal identity from my work when I’m submitting. If a design is rejected, no one is rejecting me, they’re only rejecting one idea I had. Because I’m a person capable of growth, I’ll have plenty more ideas. Also entertaining the idea that whoever is rejecting me, may not be right, is helpful. This is such a subjective area, and I’m not submitting evidence based research for my engineering thesis, I’m designing a sweater. Some people like certain things that others don’t, and personal taste differences don’t mean I’m a bad designer. Footnote, that I still feel down when I face rejection. Letting myself feel sad, in a lot of ways, can feel freeing: it’s a valid feeling.